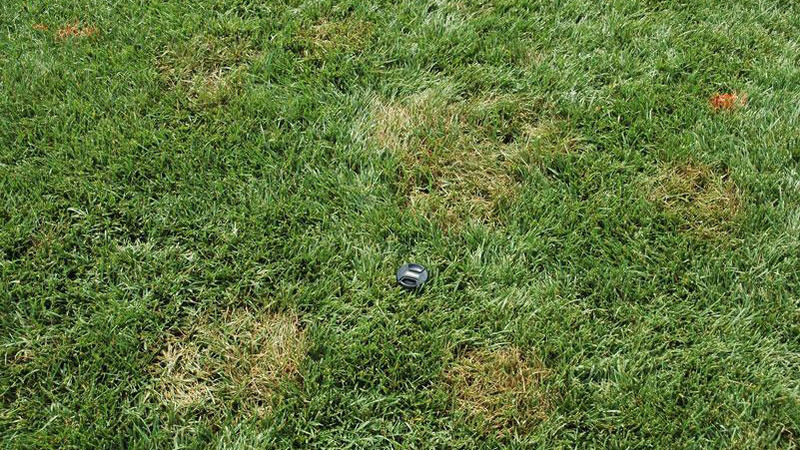 The symptoms of brown patch vary according to mowing height. 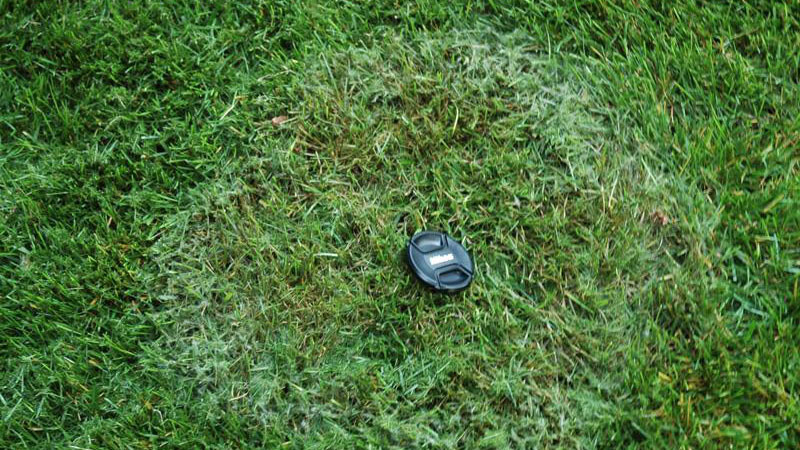 In landscape situations, where mowing height is greater than 1 inch, brown patch appears as roughly circular patches that are brown, tan, or yellow in color and range from 6 inches to several feet in diameter. 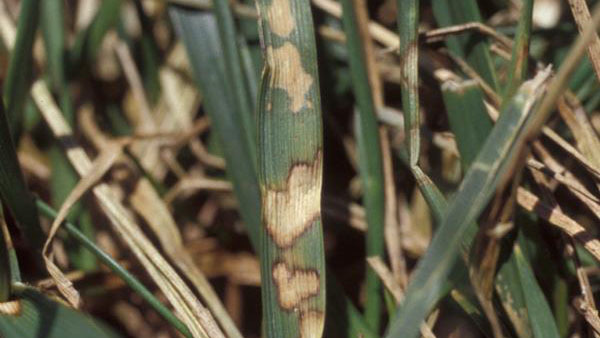 The affected leaves typically remain upright, and lesions are evident on the leaves that are tan in color and irregular in shape with a dark brown border. 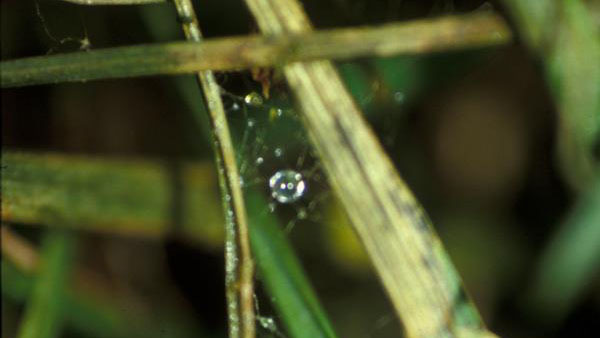 When the leaves are wet or humidity is high, small amounts of gray cottony growth, called mycelium, may be seen growing amongst affected leaves. 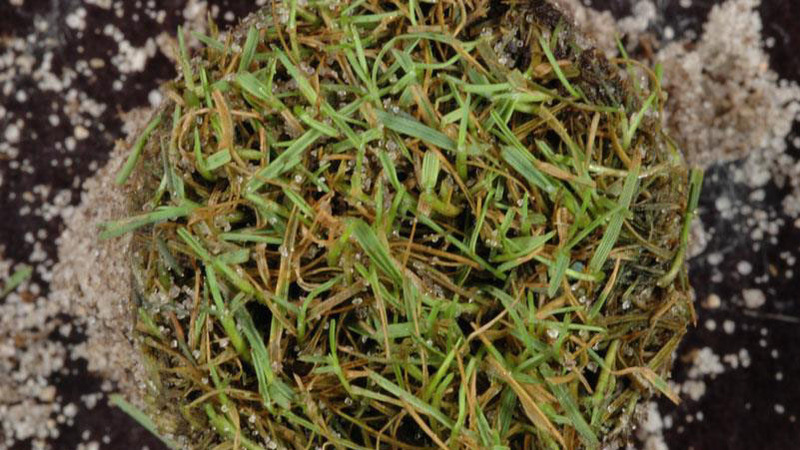 In close-cut turfgrasses (1 inch or less), brown patch develops in roughly circular patches, ranging from a few inches to several feet in diameter, that are brown or orange in color. 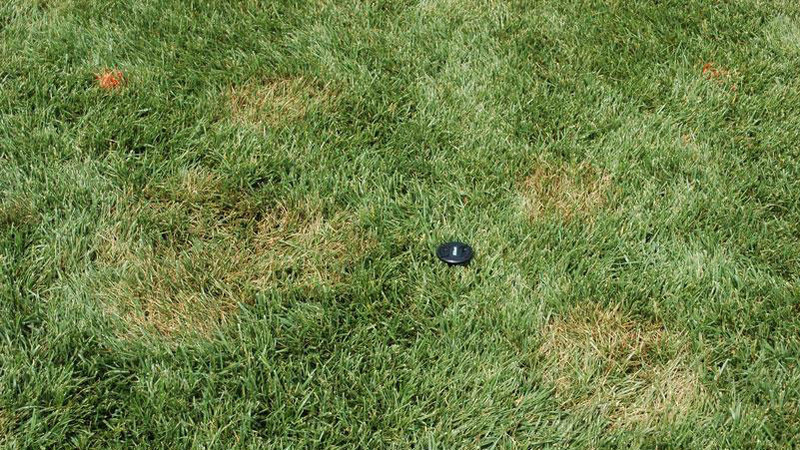 Distinct foliar lesions are not visible and mycelium is typically not present, but a black or dark gray ring, called a smoke ring, may surround the brown patches. The smoke ring is evidence of active disease development and is only present when the turfgrass leaves are wet or humidity is near 100%. 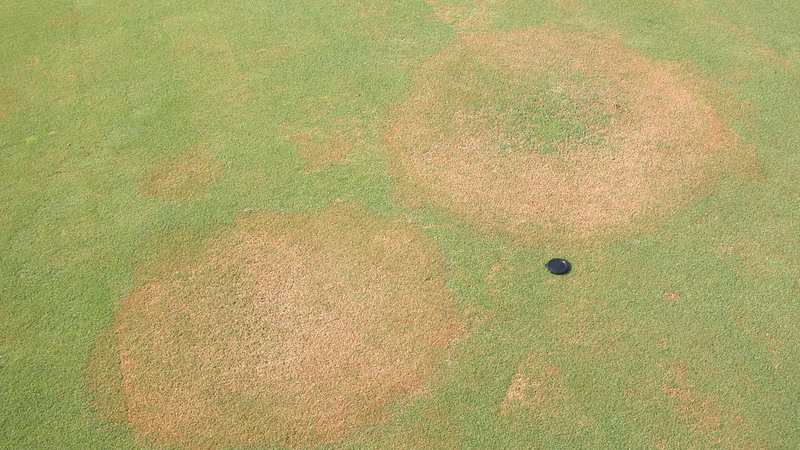 Brown patch is most severe during extended periods of hot, humid weather. The disease can begin to develop when night temperatures exceed 60°F, but is most severe when low and high temperatures are above 70°F and 90°F, respectively. 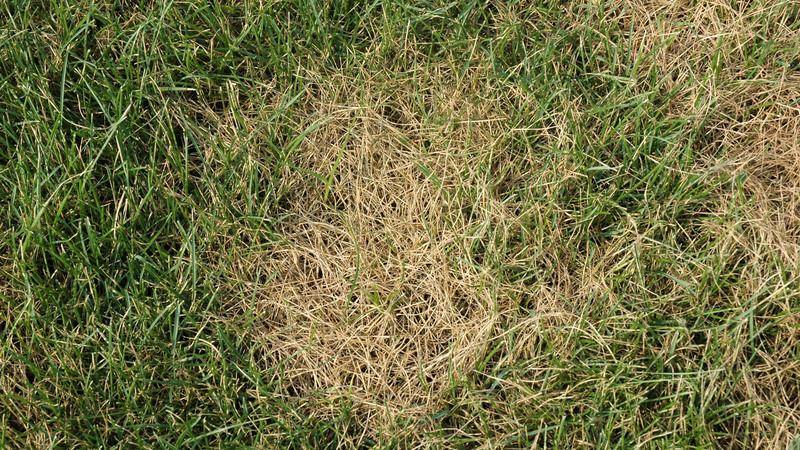 The turfgrass leaves must be continuously wet for at least 10 to 12 hours for the brown patch fungus to infect. Poor soil drainage, lack of air movement, shade, cloudy weather, dew, over-watering, and watering in late afternoon favor prolonged leaf wetness and increased disease severity. 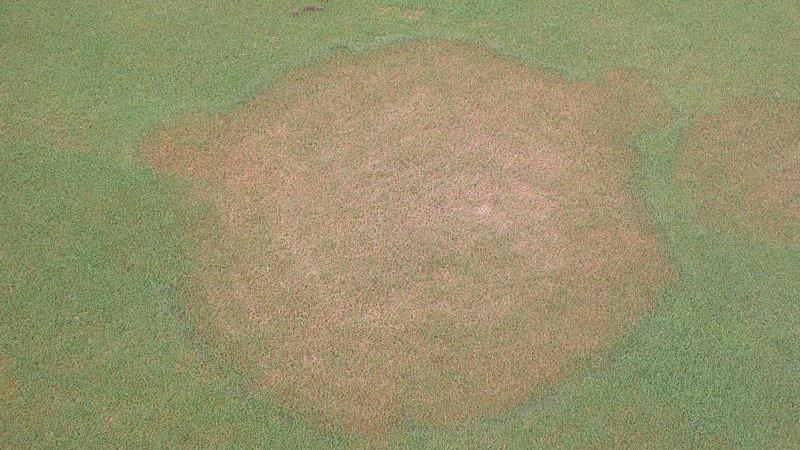 Brown patch is particularly severe in turf that has been fertilized with excessive nitrogen. Inadequate levels of phosphorus and potassium also contribute to injury from this disease. Varieties of tall fescue vary widely in their susceptibility to brown patch. 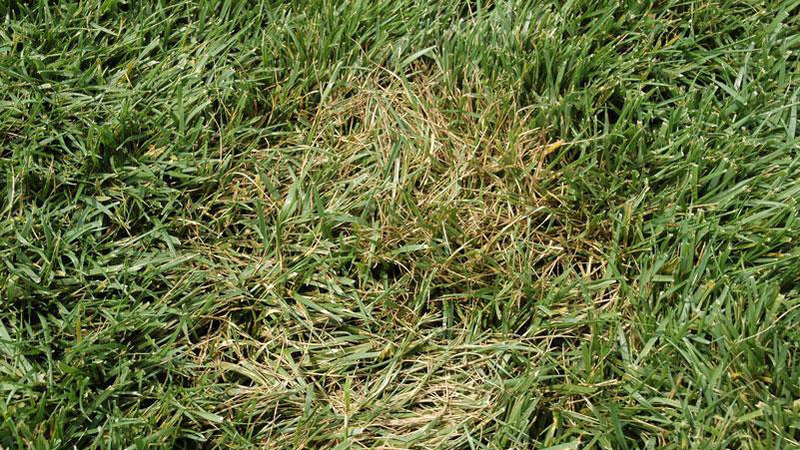 Selection of a tall fescue variety with a high level of brown patch resistance is a critical first step in any management program. 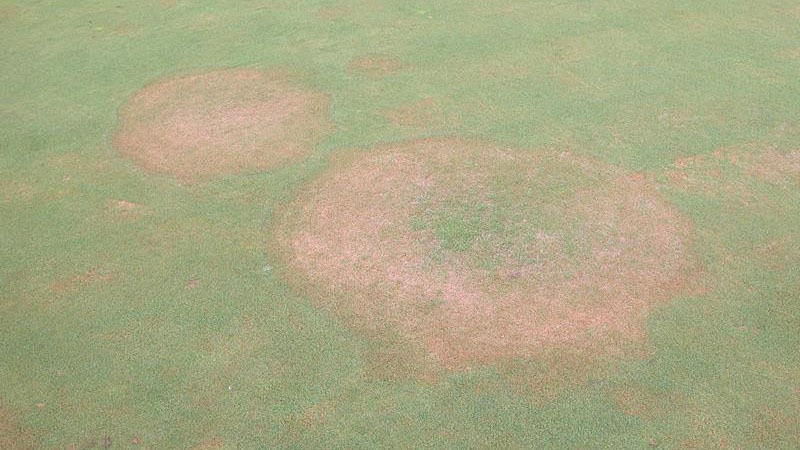 There are few differences in brown patch resistance among varieties of bluegrass, ryegrass, or bentgrass. 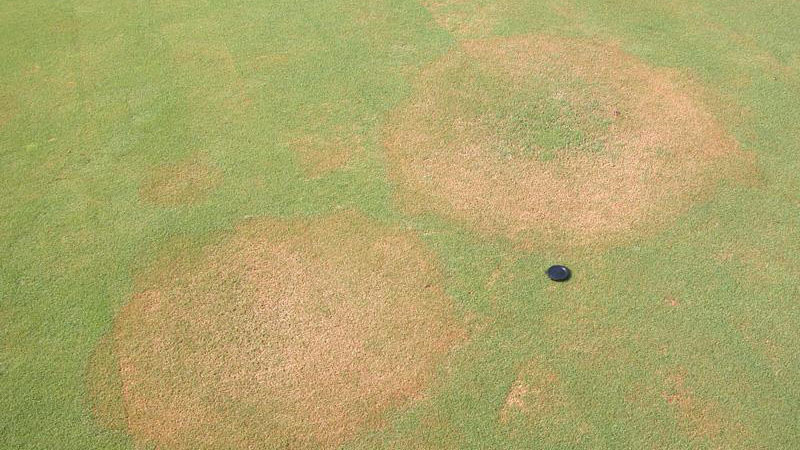 Do not apply excess nitrogen when conditions favor disease development. 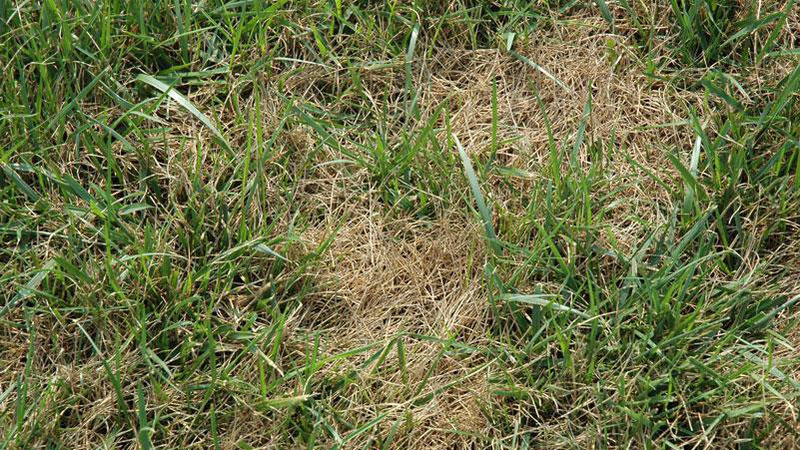 In general, cool-season grasses should not receive more than 1 pound of nitrogen per 1,000 square feet at any one time. Avoid applying nitrogen to cool-season grasses in late spring or summer, or use very low rates (0.25 lb N / 1000 square feet or less) if necessary. Ensure adequate amounts of potassium and phosphorus by applying these nutrients based on soil test results. 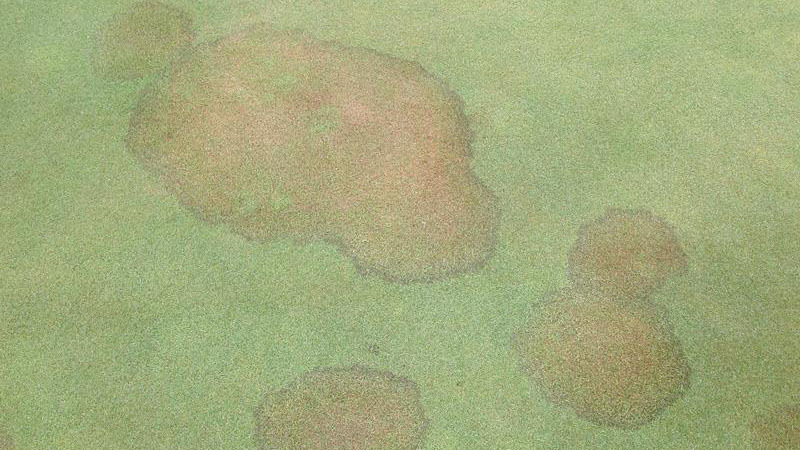 Avoiding prolonged periods of leaf wetness will drastically reduce the severity of brown patch. Leaf wetness can originate from irrigation, dew, or guttation (which is the water that is sometimes exuded from turfgrass leaves during the night). To minimize leaf wetness, do not irrigate daily. Instead, irrigation should be applied based on weather conditions and the water requirements of the turf. The Turf Irrigation Management System is available on TurfFiles as a guide to irrigation scheduling. The time of day that irrigation is applied is also critical; it is best to irrigate early in the morning, just before sunrise. This removes large droplets of dew and water from the leaves and speeds drying of the foliage after sunrise. Avoid watering after sunrise or in the late afternoon or evening, as this will increase the duration of leaf wetness. 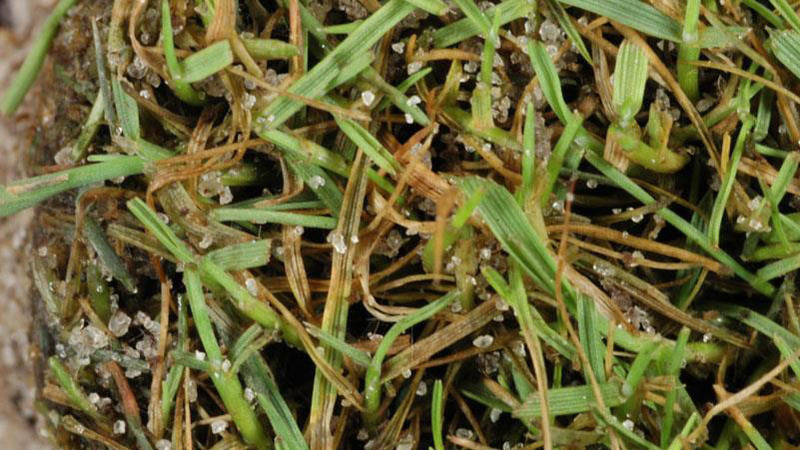 In golf course turf, daily removal of morning dew can help to shorten leaf wetness periods and reduce brown patch development. This can be accomplished by mowing, dragging a hose, or by whipping the greens with a bamboo or fiberglass pole. 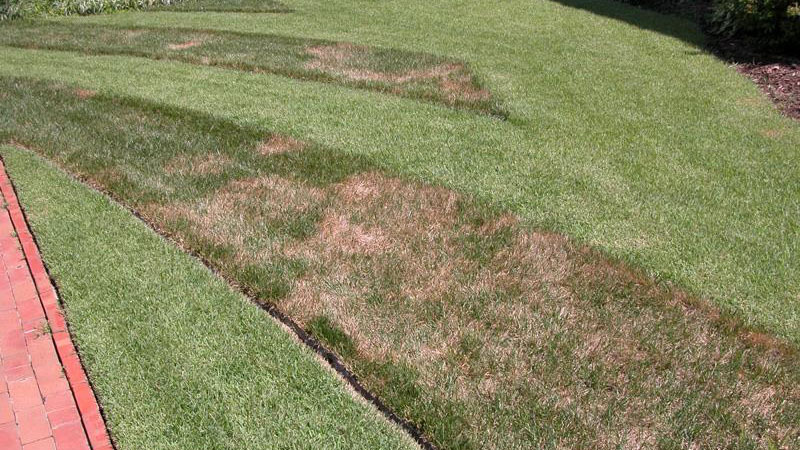 Proper landscape design and site preparation can help to minimize brown patch problems. Turf surrounded by trees, shrubs, buildings, or other barriers will remain wet for extended periods of time due to reduced air movement and sunlight. Removal or pruning of trees and other barriers will help minimize leaf wetness and discourage brown patch development. 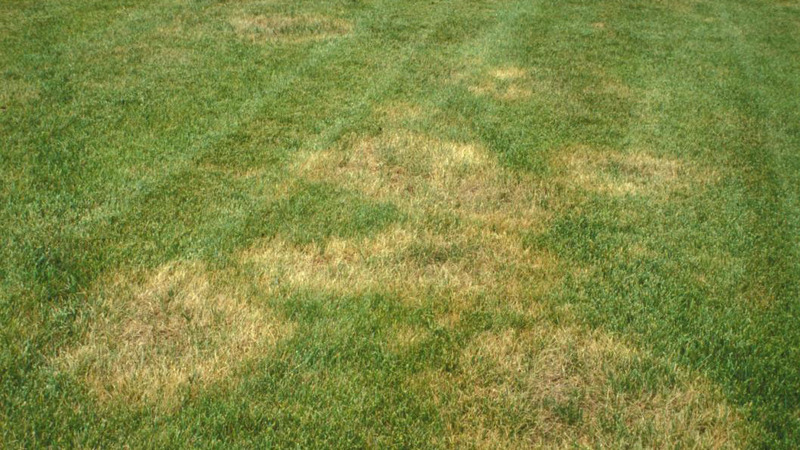 In shady areas, plant turfgrass species that are tolerant of low light levels, such as hard fescue, chewings fescue, or strong creeping red fescue..
Good surface and soil drainage will also help reduce the incidence of brown patch. Avoid establishing turf in low areas that collect water or in soil that is heavily compacted. Aerate high-traffic areas each fall to reduce compaction and maintain soil drainage. Golf course putting greens should be cultivated regularly to maintain soil drainage and aeration. Figure 16. Brown patch foliar symptoms.